Recently, I’m primarily concerned with large-scale graph data processing. Occasionally, the visualization of graph can be a good way for us to observe some properties from graph data sets. Today, I’m going to introduce a graph framework, called Java Universal Network/Graph Framework (Jung). Jung provides data structures for graph, a programming interface familiar with graph features, some fundamental graph algorithms (e.g., minimum spanning tree, depth-first search, breath-first search, and dijkstra algorithm), and even visualization methods. Especially, I’m interested in its visualization methods. The following java source shows the programming interface of Jung. In more detail, this program make a graph, add three vertices to the graph, and connect vertices. This source code is brought from Jung tutorial. As you can see, Jung’s APIs are very easy. // Make a graph by a SparseMultigraph instance. 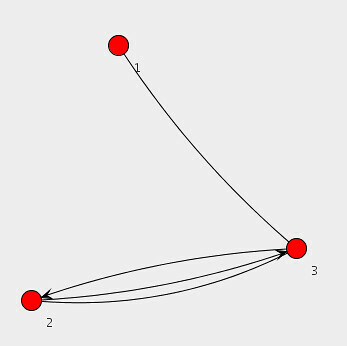 g.addEdge(&quot;Edge-A&quot;, 1,3); // Added an edge to connect between 1 and 3 vertices. // Make some objects for graph layout and visualization. // It determine how each vertex with its value is represented in a diagram. Some APIs of the Jung are based on generic programming, so you can use easily vertices or edges to contains user-defined data. If you want more detail information, visit http://jung.sourceforge.net. The above source code shows the following diagram.